An algae bloom killed some 170,000 salmon in recent days in Chile, the world's second-biggest exporter of the fish after Norway, as they were being transported by boat, raising concern about an industry that was devastated by an outbreak last year. 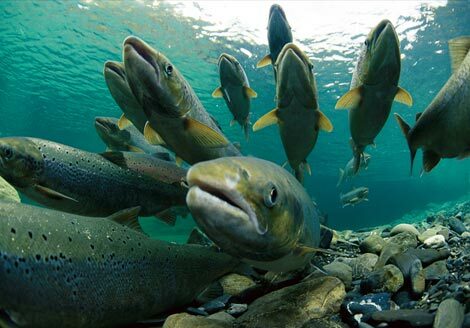 The current algae outbreak is not located near any of the salmon farms that dot southern Chile's coastline but has infested sections of the shipping lanes used by producers, the government's fisheries Sernapesca body told Reuters on Thursday. Harmful algae blooms happen when the normally occurring aquatic plants grow out of control and produce toxic effects on fish. Live fish being transported by local producers Australis Seafoods and Nova Austral were infected and killed earlier this month. The boats, which recirculate ocean water into the tanks to keep the fish alive as they are transported, inadvertently passed through the infested waters, Sernapesca said. "Warm weather and little rain were some of the reasons for the algae bloom last year, and Chile has experienced some of the same weather this year," broker Pareto said. Last year, an algal bloom killed up to 20 percent of Chile's farmed salmon, some 25 million fish, pushing prices higher globally. Part of the fish being transported were headed for harvest and others were tiny smelts that were going from fresh water to cages in the ocean. A flyover on Wednesday by Chile's navy and Sernapesca could not visually locate the algae bloom, which has a distinctive color, the government body said. Its always the same story,Algae blooms,lack of oxygen in the water.Hmmm,what could be causing this?Maybe iron fertilization in the oceans,maybe heavy metals from the Chemtrails all over the world.Maybe 300 tons of radioactive waist being poured into our oceans daily from Fukushima.Matbe all the other crap that we dump in our oceans daily.Oh but the experts and scientist are perplexed...Cant figure it out...Wake up people the powers to be do not want us here.This is not happening by accident..